On the other hand, the Dharmic vision perceives the world and personal life through the perspective of the Buddhist teaching (Dharma) where everything is explained in terms of the preciousness of human birth, impermanence, the law of karma, and the suffering inherent in all the samsaric realms of existence (the Four Thoughts). Also, what is truly important is defined in a different way than immediate utility, and the attainment of Freedom from samsara for us and all beings is considered to be supreme. By reading, listening and deeply reflecting on the explanations offered by the Dharma about the world and our existence, one comes to understand why it is necessary to become a Buddha. By engaging more and more in the study of the Dharma, and by deeply understanding the Four Thoughts, we reach the point when we receive the so called, “Dharmic vision” or “Dharma eye”. Then, many of our mental constructions that we considered to be solid and unbreakable will break down and the world will start to empty itself of the false colors projected on it and taken as the true reality. Walking the Buddhist path with the aspiration to become a Buddha and having the Dharmic vision on our side, we become more intimate with our own karma, that is, we start to know ourselves better and especially our spiritual limitations. This stage – the awareness of our spiritual limitations in comparison with the effort of becoming a Buddha – is extremely important and especially emphasized in Jodo Shinshu. As I already explained in the various sections of the Four Thoughts, nothing is permanent in samsara, especially our so called "spiritual achievements". Thus, everything we think we attain now can be gone in the next hours, days or months, because our mental states are always changing. As death may come at any moment, we really do not have time for the so called "spiritual evolution" and the influence of our habitual karma from eons of living in the darkness of delusions and blind passions is always at work to hinder our most noble aspirations. When we reach the point where we wish to escape samsara, but realize it is impossible to do it through our own power and limited capacities, we may become ready to accept Amida Buddha's helping hand that is extended to us and all beings. If we listen deeply to Amida's simple message of salvation, entrust to Him, say His Name in faith and wish to be reborn in His Pure Land, we will finaly arrive at the end of our insane journey in samsara. This means that we become assured of birth in the Pure Land of Amida, and after we die we'll be reborn there and attain perfect Enlightenment. By fully understanding the Four Thoughts as they were explained in this book, we easily come to accept the Three Pillars of Jodo Shinshu, that is, 1) we aspire to attain Buddhahood (perfect Enlightenment), 2) we realize our limitations and the imposibility of attaining this goal through our own power, and 3) we entrust to Amida Buddha in order to attain Buddhahood in His special Enlightened realm where, unlike our samsaric environment, everything there is conducive to Enlightenment. Faith (shinjin) as it is understood in Jodo Shinshu contains this twofold profound conviction (nishu jinshin): 1) we know that we are persons of deep karmic limitations, incapable to attain Buddhahood through our own power; and 2) we know that only Amida Buddha can save us through His Vow Power, without asking anything from us. To aspire to become a Buddha is fundamental but this aspiration remains just an unfulfilled desire like many others if our personal capacities cannot lead us to this goal. It is not necessary to become a saint or some kind of special kind of person in order to have the aspiration to become a Buddha, but to be successful in attaining Buddhahood we'll need efforts and qualities infinitely greater than our ordinary capacities. So, in the moment we realize that it is impossible to attain this state through our own power, we are ready to hear the message of the Primal Vow of Amida Buddha. It is very important to understand that Jodo Shinshu doesn’t require to consider ourselves incapable in our daily activities, but only in matters of attaining supreme Liberation. To become a Buddha is not the same thing with being a good electrician, business man or anything we want in our private life. Such a difference should be very well discerned. These being said, lets talk in more detail about the benefits of being born in the Pure Land. Where do we learn about these benefits? First, from Amida Buddha himself as He promised in many of His vows that we'll experience them after being born in His Pure Land. Second, from Shakyamuni Buddha who made great efforts to convince us about the existence of Amida Buddha and His Pure Land, by telling the story of Amida, describing His Enlightened Realm whenever He had the occasion, and by showing both of them to Ananda and the audience gathered on Vulture Peak. Third, from the Masters of our lineage and other lineages who also taught about the various benefits of being born there. As soon as he had said this, Amitayus emitted a great light, which illuminated all the Buddha lands. The Encircling Adamantine Mountains, Mount Sumeru, together with large and small mountains and everything else shone with the same [golden] color. That light was like the flood at the end of the period of cosmic change that fills the whole world, when myriads of things are submerged, and as far as the eye can see there is nothing but the vast expanse of water. Even so was the flood of light emanating from Amitayus. All the lights of sravakas and bodhisattvas were outshone and surpassed, and only the Buddha’s light remained shining bright and glorious. At that time Ananda saw the splendor and majesty of Amitayus resembling Mount Sumeru, which rises above the whole world. There was no place that was not illuminated by the light emanating from His body of glory. The four groups of followers of the Buddha in the assembly saw all this at the same time. Likewise, those of the Pure Land saw everything in this world. Then the Buddha said to Ananda and Bodhisattva Maitreya, 'Have you seen that land filled with excellent and glorious manifestations, all spontaneously produced, from the ground to the Heaven of the Pure Abode?' Ananda replied, 'Yes, I have.' The Buddha asked, 'Have you also heard the great voice of Amitayus expound the Dharma to all the worlds, guiding sentient beings to the Way of the Buddha?' Ananda replied, 'Yes, I have.'" The passage is clear and can’t be misinterpreted. 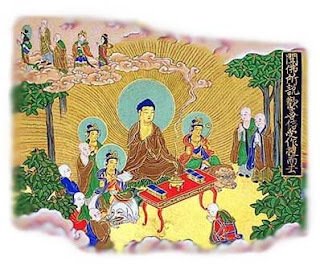 Ananda asked Shakyamuni to see Amida and His Pure Land - “I wish to see that Buddha, His Land of Peace and Bliss”, and then he actually saw Him – “Ananda saw the splendor and majesty of Amitayus”. In fact, not only him, but all those gathered there on Vulture Peak to listen to the Larger Sutra, saw Amida and the Pure Land – “the four groups of followers of the Buddha in the assembly saw all this at the same time”. Both those in this world and those in the Pure Land, saw each other – “likewise, those of the Pure Land saw everything in this world”. No sincere follower and reader of the above lines can possibly misinterpret what happened there. The revelation of Amida Buddha and His Land really took place, and the audience literally saw them before their very eyes. There is no hidden, metaphorical or symbolical meaning in this. I repeat, the audience literally saw them before their very eyes. Anybody who tells you that you should not actually take into consideration this vision of Amida and His Land, as it was described in the sutra, is a person who lacks faith and who is consciously or unconsciously deceiving you, so please stay away from such people. To this, Ananda replied, “Yes, I have”. “I have expounded this teaching (sutra) for the sake of sentient beings and enabled you to see Amitayus (Amida) and all in his Land. Strive to do what you should. After I have passed into Nirvana, do not allow doubt to arise." Also, beside showing Amida Buddha and His Pure Land, Shakyamuni Buddha described that Enlightened Realm whenever He had the occasion. 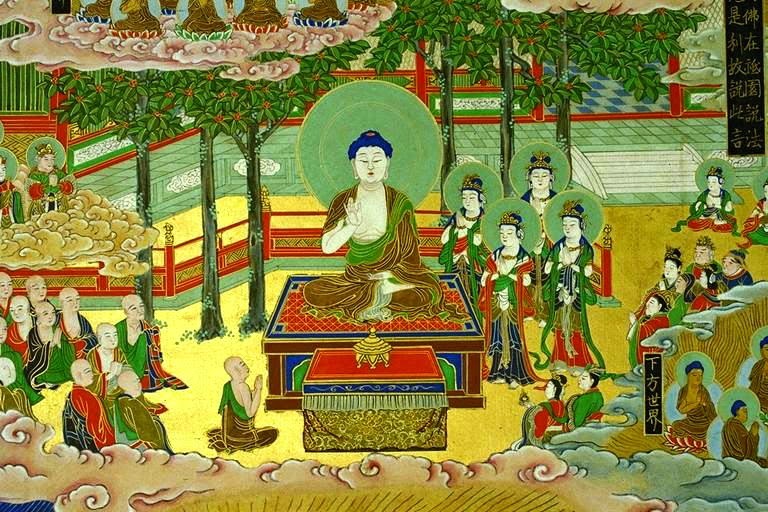 For example, in the Smaller Amida Sutra (Amidakyo), Shakyamuni describes the Pure Land to Shariputra in an ecstatic manner not even giving time to His listener to ask questions. He starts preaching that sutra without being asked and He says on and on something like: “Shariputra, it is wonderful, that place is supreme in beauty…. Shariputra, in that land there are so and so places and so and so precious treasures…. Shariputra …….Shariputra…”. It seems that Shakyamuni doesn’t even allow himself time to breathe when He speaks about the beauties of the Pure Land, such is His enthusiasm in presenting them. Also, again in order to show that Amida’s Pure Land is not a metaphor, but a real place in which people can actually aspire to be born after death, the land is given a direction - the Pure Land of the West. Some say that the direction “west” and the marvelous descriptions of the Pure Land are a proof for its non-existence or for its existence as a symbol or metaphor only. But the truth is that by making the effort to describe in many words the wonders of the Pure Land and by pointing to a direction where to face the Pure Land when worshipping Amida Buddha, Shakyamuni wants to emphasize its actual existence as a place where sentient beings should aspire to be born without worry and doubt. It is as though I speak to you about a beautiful park I would like you to visit. If I tell you, “it’s there, in the West part of town” and I start describing it to you, then you will have no doubt about its existence and you will wish to see it. It’s the same with the expression “Pure Land of the West”. The exaltation with which Shakyamuni Buddha described the Pure Land of Amida in the Smaller Amida Sutra (Amida-kyo) without even being asked to do it (Amidakyo is a sutra spontaneously delivered, not in response to a question), or the radiant light that emanated from His body when He delivered the Larger Sutra in which He expounded the story of Amida and His 48th vows, are both an indication that His words were true and His listeners should accept Amida as a living Buddha and His Pure Land as a real place. Again, in order to deny that the Pure Land is a real enlightened place with forms and manifestations, and stop you from awakening the true aspiration to be born there, some would try to present the Pure Land only as a state of consciousness. But you should not be fooled by them, because states of consciousness do not exclude forms and manifestations! In fact, depending on the states of consciesness one dwells in, various forms appear. Thus, for unenlightened beings, samsaric bodies and realms come into existence as effects of their specific karmic obscurations. When one becomes a Buddha, transcendental manifestations arise as the effect of Enlightenment and the wish to save all beings. This clearly shows that the Pure Land is both an existing place and a place of Enlightenment. The foundation of samsara is ignorance and blind passions; the foundation (essence) of the Pure Land is Nirvana or Perfect Enlightenment. Both ignorance and Enlightenment are accompanied by forms. Ignorance and blind passions give rise to various samsaric realms, while perfect Enlightenment manifest Pure Lands. Thus, the Pure Land of Amida Buddha is the effect of His Enlightenment and the wish to save all beings as expressed in His 48 Vows. This is the right teaching on the Pure Land. Again, the right way to define the Pure Land in our human language is - the enlightened realm of Amida Buddha. It is extremely important to understand that manifestations, from the hells to the Pure Land, come into existence due to causes and conditions. If you have a karma so evil that you deserve to be born into hell, you will be born there; if you have the karma to be born as human you will be born as a human, and so on… Just like unenlightened beings karmically manifest unenlightened realms with various pains and obstacles, a Buddha manifests an Enlightened Realm. If in the first case, the manifestations in unenlightened realms are conducive to more attachments and delusions, in the Pure Land of Amida Buddha there are enlightened manifestations and forms which lead to Enlightenment. As we have seen above, in Shakyamuni's explanations, the birds of the Pure Land are not the result, like in our realm, of an unenlightened karma, but are manifested by Amida Buddha. If in the hells, various birds and terrifying beasts prey on the hell dwellers because those birds and beasts are the effect of the karma of hell dwellers, in the Pure Land the various birds sing Dharma music and speak about Nirvanic truths because they are manifested from Amida’s Enlightenment. Both animals (those of hell and the Pure Land) are real, but they exist due to different causes. The beasts from hell have the cause in an unenlightened karma (the karma of hell dwellers), while the second have their cause in Amida’s Enlightenment, and in Bodhisattva Dharmakara’s Vows which were brought to fulfillment when He became Amida Buddha. "Even the pleasures of the hundred million thousand years of life in Toriten or the pleasures of the deep ecstasies of Mahabrahman’s palace are not to be regarded as pleasures in comparison with these pleasures of the Pure Land. When the karma of reward is exhausted the one living in Toriten or Mahabrahman’s palace falls at last again into the cycle of change and he cannot escape from the three evil realms, but this one who has been born into the Pure Land is now resting thankfully in the arms of Kannon (Avalokitesvara Bodhisttva) and he is dwelling securely on the Treasure Lotus Seat. Having passed a long period of time in crossing the Sea of Suffering, he has now for the first time been born into the Pure Land, and his happiness is thus beyond the power of words to describe." These transcendent manifestations also show that the Pure Land surpasses all other places in the world of suffering – “surpass in supreme excellence anything in the worlds of humans and devas”. Again, it is clear that the treasures found in the Pure Land are not intended for the enjoyment of the six senses but for expressing the Dharma, calling beings to the Dharma, praising Amida’s virtues and showing the supreme place this enlightened land occupies among other Buddha lands. They are spiritual treasures, even if they are described using the terms we are familiar with, like palaces, pavilions, ponds, streams and trees, aromatic wood, etc. "When a person has entered completely into the Pure Land of happiness, he or she immediately realizes the supreme Nirvana; he realizes the supreme Enlightenment". From this benefit, all other benefits emerge like branches of a tree. Thus, once we become Buddhas in the Pure Land, we’ll have access to the ultimate reality beyond form (Dharmakaya), we’ll dwell forever in transcendent form (Sambhogakaya) in Amida’s Pure Land, and in the same time we’ll go in all the places of the universe in various Bodies of Accomodation or Transformation (Nirmanakayas) to save all beings. The promise of attaining Buddhahood and returning to help all beings was made by Amida Buddha in His 11th and 22ndVow respectivelly. Because in the Pure Land we'll be dwelling in Nirvana, we'll have "noble and majestic countenance, unequaled in all the worlds" and our appearance will be "superb, unmatched by any being, heavenly or human". We'll be "endowed with bodies of Naturalness, Emptiness, and Infinity." Amida Buddha promised in His 3rd Vow that we'll have "the color of pure gold" while in His 4th Vow He said we'll "be of one appearance", without "any difference in beauty". As we know, unenlightened samsaric beings have various forms and shapes, color and beauty, being very different from one another due to the different types of karma they inherit from past lives. But once we are born in the Pure Land and become Buddhas we are liberated from the shackles of karma and go beyond form, color and any differences. This is what is meant by “all be of one appearance”. To be of the color of pure gold also means to have transcendent bodies of the qualities of Enlightenment. 'In Amida’s infinite and accommodating realm there is no bad purpose or foolish wisdom. There is no illumination in evil causes but only natural progress in the Buddha Way. If one obtains birth there he will be unmoved and he will attain full Enlightenment." "The beings in the Pure Land, having bodies of golden color and being pure inwardly and outwardly, give forth a brilliant light and thus mutually glorify each other. They have thirty-two forms and they are so sublime, upright and marvelous that there is nothing with which to compare them in this world. [...] If we should compare the masters of the Six Devalokas with the beings of the Pure Land it would be like a beggar standing alongside of a king." In His 15th Vow Amida Buddha promised that we'll have unlimited life-spans, which means that our Sambhogakaya (transcendent) body in the Pure Land will have no end, and that we will forever manifest in various forms (Nirmanakayas) all over samsara to save beings, maintaining those manifestations as long as we wish. Actually, as Enlightened ones, we'll go beyond birth and death, so we can be in the Pure Land and in other worlds at the same time. In His 5th Vow, Amida Buddha promised that after being born in the Pure Land we'll remember “all previous lives” and know “the events which occurred during the previous hundred thousand kotis of nayutas of kalpas”, while in the 6th Vow He promised we'll “possess the divine eye of seeing even a hundred thousand kotis of nayutas of Buddha-lands”. In the 8th Vow He assured us that we'll have “the faculty of knowing the thoughts of others”, and in the 9th Vow that we'll be able to go “anywhere in one instant, even beyond a hundred thousand kotis of nayutas of Buddha-lands” so that we can always be together with any being we want to help. For beings in our world it is impossible to see without sun light or lamp-light; and, without moving, it is impossible to approach an object. We cannot see through even one sheet of paper. We know nothing of the things in the past; we know merely the things of the present moment. We are still confined to the cage and obstructed in every direction. But as for the beings in the Pure Land there is not one which does not have this power (of mysteriously transcending space and time). 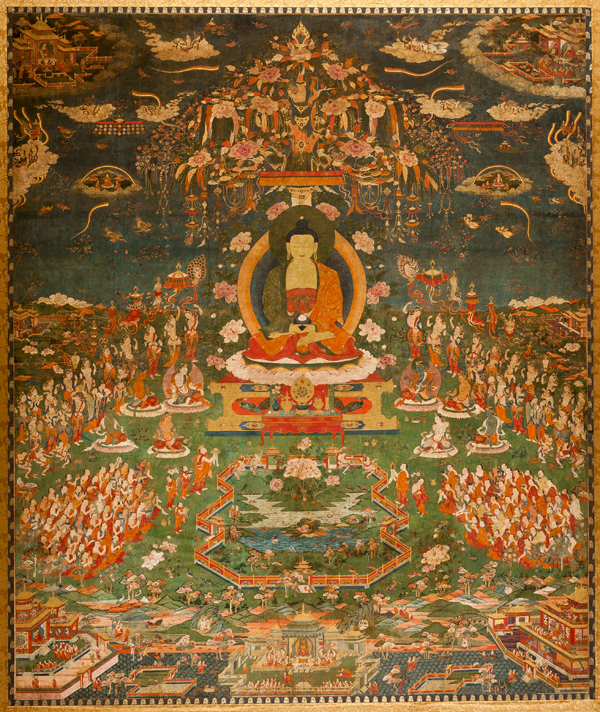 Even though for a period of a hundred Great Kalpas they have not planted the seed (karma) of the Special Characteristic Forms and have not created the cause for the Mysterious Communications, during the Four Meditations, they still have this power as a natural consequence of having been born into the Pure Land. How happy, then, they must be!". "The things men seek after while living in this world are not really in accordance with their hearts’ desires. The tree seeks to be quiet but the wind blows without ceasing. The son wishes to take care of his parents but the parents do not survive long enough. And even though the parents should live, the son, in the case of a poor family, cannot provide what his filial piety would prompt him to do even though he would be ready to 'burst his bladder' in the attempt. If he goes far away from home or business he will be unable to look upon the graceful faces of his parents in the morning or care for them in the bed-chamber in the evening. As all this is impossible for him, he breaks his heart in vain in the effort. The same thing is true in the relationship of master and servant, teacher and disciple, husband and wife, friend and friends, among relatives and with all people, to whom one owes an obligation. By worrying thus with a heart of foolish love one only increases the work of karma. Every man knows where he is now and what kind of life he is living in the six realms and the four births. But who knows that the animal in the field or the bird on the mountain may not once have been our parents in their former existence. This thought is expressed in an old poem which reads: 'There is a cuckoo in the hillside field crying ‘Cuckoo! Cuckoo!’ Who knows but that it is my father or my mother.' In a verse of the Shindikwagyo we read: 'Men in this world commit various sins for the sake of their children and then they fall down into the realms of hell, hungry spirits or animals to receive suffering for a long time. Not being saints nor having the mysterious power of communication they cannot understand their former transmigrations. All beings fail to make retribution by kindness to others. All beings are caught on the wheel of birth and death. They pass around from stage to stage in the six realms like the wheel of a wagon, without beginning or end. At one time they are father or mother, at another time may be husband or wife, and they show kindness to each other during the various lives in this world. But if they are born into the Pure Land they are endowed with a superior wisdom and their clear power of mysterious communication reaches unto those who were formerly their benefactors and to those who were their acquaintances through many lives and generations, they can attract them freely. Endowed with a heavenly eye, they can see where they live, and with their heavenly ear they can hear their voice. Their wisdom of destiny enables them to remember the favors (of their former benefactors) and with their insight into others’ hearts they understand their hearts. Their mysterious powers of communication enable them to go where they are, and by changing their form they can adapt themselves to their needs and in various ways teach them and lead them in the way of salvation." In the 7th Vow Amida Buddha promised that we'll have the “divine ear of hearing the teachings of at least a hundred thousand kotis of nayutas of Buddhas” and “remember all of them”, that we'll directly worship all Buddhas in all the ten directions (24th Vow), make offerings to them (23rd Vow), and hear spontaneously whatever teachings we may wish (the 46th Vow). 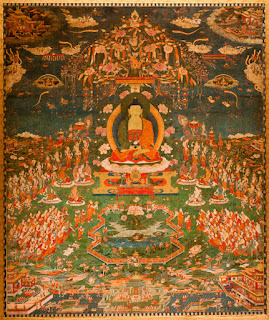 "While believers are still in this present world, seeing and hearing through the scriptures about the various virtues of the Buddha lands of the Ten Directions, they beget a heart of longing and they say sadly to each other: 'When shall we be able to see the pure lands of the ten directions and meet with the various Buddhas and Bodhisattvas?' But if one should by chance obtain birth into this Pure Land one can go in the morning and return in the evening or go and come in a moment to and from all the Buddha lands which lie in the ten directions. There one may serve the various Buddhas, live with the great teachers and continually hear about the true Dharma. Such a one obtains entrance into the perfect Enlightenment. Moreover, such a one can enter the various mundane spheres, engage in the various Buddhist ceremonies and practice works of benevolence. Is not this real joy?" Not only that we'll be able to go to other realms to worship, make offerings and listen to the teachings of other Buddhas, but many saints and Enlightened beings will also come to the Pure Land to pay homage to Amida, so we'll also be able to meet with them there! "As it is said in the Scriptures, 'All beings who hear of these pleasures rouse a desire to be born into this Land. That is because they can meet in fellowship with the various people of the highest good.' The virtues of the hosts of Bodhisattvas are wonderful." The Pure Land is filled with a throng of holy beings who have a common life, see each other and hear each other’s voice and who seek after the same way. There is no difference among them. There are numberless beings and Bodhisattvas from the Buddha lands of the ten directions, as numerous as the grains of sand on the Ganges river. Each one of these reveals his mysterious power of communication and comes to the Pleasant Country (Pure Land) where he looks upon the precious face of Amida Nyorai and makes offerings to Him in reverence. Some of them make offerings of wonderful heavenly flowers, some burn a wonderful kind of incense, and some offer priceless garments. There are some who make heavenly music and praise the Nyorai with soft and calm voices. Some listen to the scriptures or propagate the teaching. There is no hindrance in their going and coming night and day. Some go away to the east while others are coming from the west. Some go away to the west while others are coming from the north. And again some return to the north while others are coming from the south. Thus the throngs come and go from the four corners, the eight directions and the directions up and down. It is like a flourishing marketplace. To hear once the names of such saints does not happen by accident. How much more likely then, must it be to meet with one through the hundred, thousand, ten thousand kalpas! And the beings in the Pure Land gather together continually in one place and talk with each other, exchange stories, ask questions, act with prudence, respect and are friendly toward one another and become intimate with each other. Is this not real enjoyment? “Whether going or coming, proceeding or remaining, their hearts are unattached, their acts are in accordance with their will and are unrestricted, and they have no thought of discrimination. In them there is no idea of self or others, no idea of compensation or dispute. With the heart of great Compassion to benefit all living beings and with tenderness and self-control, they bear no enmity or grudge against anyone. Free of mental hindrances, they are pure in mind and without indolence. […] Their samsaric bodies and evil passions have been extinguished together with their remaining karmic tendencies. […]Their wisdom is like the ocean, and their Samadhi, like the king of mountains. [….They are like the great earth, because they have no discriminative thoughts, such as pure or impure, beautiful or ugly. […] They are like the sky, because they have no attachments. […] They are like a flock of playful birds, because they do not store things. [….] They are like the vast sky, because their great Compassion reaches everywhere without discrimination. They have destroyed envy by not being jealous of the superiority of others. […] Thus they become lamps to the world and fields of supreme merit; they always become teachers and harbor no thought of discrimination, aversion or attachment”. According to the 16th Vow, no wrongdoing will be found in us after we attain Buddhahood in the Pure Land, no ignorance and blind passions, but only perfect hapiness as also promised in the 39th Vow. Thus, because of the absence of ignorance and blind passions, in the Pure Land there are no lower realms (1st Vow) and no so called "higher realms", and once born there we'll never fall again in samsaric existence (2nd Vow). According to the 25th Vow, 29th, and the 30th Vow, we will have unsurpassed and "all-knowing wisdom" for instructing beings everywhere in accordance with their capacities. More than this, we'll be “endowed with the body of the Vajra-god Narayana” (26th Vow). Vajra- god Narayana is in fact Vajrapani (from Sanskrit vajra, "thunderbolt" or "diamond" and pani, lit. "in the hand"), one of the most important Enlightened Bodhisattvas of Mahayana Buddhism. He is the protector of Buddha Dharma, and He represents the Power of all Buddhas. Just as Samantabhadra Bodhisattva, mentioned in the 22nd Vow, represents the endless saving activity of all Buddhas, Vajrapani represents the immense and all surpassing Power of the Buddhas. After birth in the Pure Land we'll be exactly like these two Enlightened Bodhisattvas. Just like Samantabhadra we'll always be active in samsara, and like Vajrapani we'll be all-powerful. And because Vajrapani is a protector of the Dharma, we will also become Dharma protectors and destroyers of wrong views. I explained in more detail all the 48 vows of Amida Buddha in my book, The 48 Vows ofAmida Buddha, Dharma Lion Publications, Craiova, 2013. Also, the specific vows related with the capacities of beings born in the Pure Land are to be found at chapter III, p. 79- 92 of the same book, as well as page 66 where I explain the 22nd Vow. Amida Buddha has two aspects, “Infinite Life” (Amitayus) and “Infinite Light” (Amitabha). These two are merged into the word “Amida”, which means the Buddha of Infinite Life and Infinite Light. According to the Contemplation Sutra, Amida Buddha and His Pure Land were also shown to Queen Vaidehi, wife of King Bimbisara from Magadha. Ananda and Mahamaudgalyayana, two of His main disciples, were themselves present as witnesses of this revelation. For this, please go to page 82 from my book The True Teaching on Amida Buddha and His Pure Land, Dharma Lion Publications, Craiova, 2015. Toriten, the second of the Six Devalokas. Three Evil Realms are Hell, Realm of Hungry Spirits and Realm of Beasts. Avalokitesvara and Mahasthamaprapta are the two Enlightened Bodhisattvas who accompany Amida Buddha in His Pure Land, helping all beings, in various ways, to entrust to Amida and be born there. One who was born in the Pure Land through the gate of faith is secured in his attainment of perfect Enlightenment. The "treasure lotus seat" is the throne of Enlightenment. A poem by Bodhisattva Nagarjuna as quoted by Master Genshin in his Ojoyoshu. When the word “dharma” is used with small “d” it refers to all existence and phenomena in general. When its used with "D" like in "Dharma" it means the Buddha's teaching. Six realms of samsaric existence.